The Apple Watch 4 is crammed full of improved features, from its ECG heart monitor to its much louder internal speaker. So how does Apple squeeze more tech in, without making its wrist-mounted computer unwearable? With some engineering ingenuity, that's how. The teardown team at iFixit has yet again exposed the innards of the latest Apple gear, revealing a significant internal redesign over the Apple Watch 3. One of the standout changes, and one that could be cause for concern, should you merely be laser-focused on the numbers alone, would be changes made to the smartwatch's battery packs. While the 38mm sees a welcome 4% battery capacity increase over the Series 3, the 42mm Series 4 actually loses 17% capacity – despite being the bigger of the two timepieces. According to iFixit, that's a 1.12Wh battery, compared to 1.07Wh in the previous 38mm Series 3, and a worrying drop from 1.34Wh of the 42mm Series 3. Put the numbers in a chart running side-by-side across the wearable generations, and you'd be inclined to favor the smaller watch regardless of your preference on screen size purely on perceived battery run times. But in our experience with the Watch Series 4, that's just not the case. Despite the larger screen size, the Apple Watch 4 doesn't only match Apple's quoted 18-hour run time, it smashes it, even when under stress. [The Apple Watch 4] frequently outperforms the quoted run time by more than double. It's a point that our Apple expert and Watch Series 4 reviewer Gareth Beavis has long noted. 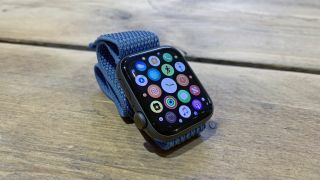 "The battery life on the Apple Watch – since the first model – has always been confusing, as it frequently outperforms the quoted run time by more than double," says Beavis. "If we'd not been for a run and fired the GPS, we'd often go to bed with 50% charge remaining, having taken the Watch off charge 17 hours previously. While you won't get to two days' use comfortably, if you're in a pinch the possibility is there." This achievement seems to have been managed thanks to the improved efficiency of the 64-bit S4 processor, which has allowed the changes to be made in terms of battery capacity. A 'Silicon in Package' system, it's the only gadget in the world where all the processor circuitry is fabricated onto a single component, according to the Apple website. As well as being efficient, it's powerful too, running twice as fast as previous generations. When a new product launches, especially in the early stages of its life before it hits shelves, it can be easy to focus on specs and treat them as some sort of gospel truth of anticipated performance. It's something that we as tech reporters can wrongly over-emphasize ourselves, as we look to find as much hands-off information as possible about a product before we eventually get hands-on with it. But as the iFixit teardown and our own review time prove, a spec sheet is no match for genuine experience. Try before you buy, indeed.